The dazzling speed at which Asia has grown in the past 50 years has obscured a fact we often overlook in Australia: most of the countries and people in our part of the world remain terribly poor. 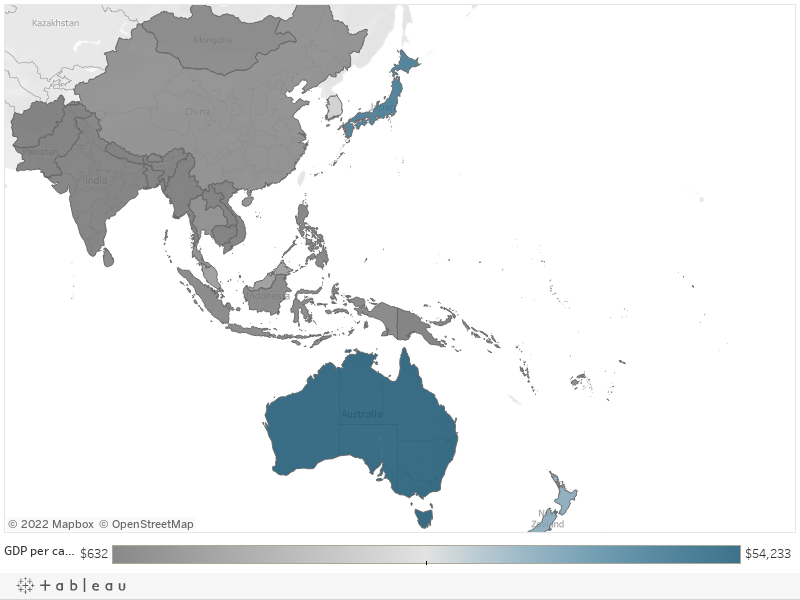 Only a handful of countries are on a stable pathway to achieving the prosperity that we enjoy in Australia, and the list that have achieved parity with us is even smaller, as the map below demonstrates. This is something that our foreign policy does not fully appreciate. For most of Asia and the Pacific our vague concept of ‘development’ remains very real, and sits squarely at the top of their agendas. Surely working with our nearest neighbours on the issues most important to them is within Australia’s national interest. The White Paper provides an opportunity to clearly acknowledge this. While development is critical for most of the countries around us, it is an area of Australian foreign policy that has become increasingly marginalised. If this continues, our ability to effectively work in the region will also be reduced. The White Paper is an important opportunity to reframe development (a concept that stretches far beyond aid) as a critical element in our foreign policy toolkit, one that should be considered as carefully and ranked as highly as diplomacy, trade and security. Engaging with our region on development challenges in a constructive and long-term fashion is critical to our national interest in that it helps build a prosperous region while maintaining strong bilateral partnerships. There could be no better way of enshrining its importance than renaming DFAT to incorporate development. The Minister for International Development and the Pacific should also be promoted to Cabinet rank to make the position less of a political stepping stone. Such recognition would also acknowledge development goes way beyond engaging with our partners through our aid program. As important as the aid program is, a change in the language our diplomats use and the culture within our foreign service is even more critical. We cannot afford to let development become a dirty word. When it comes to engaging in development challenges in our region, Australia has few tools as powerful as our $3.8 billion foreign aid program. By recognising the importance of development, the White Paper should also acknowledge the critical role a robust, forward-thinking and effective aid program will play in building and maintaining relationships and prosperity in our region. Our aid program faces many challenges beyond the obvious one that it now sits at the lowest levels in Australia’s history. The only boundary we seem able put on our aid program is how much of it we will give, but not what it will be spent on. This has led it to be spent on just about anything that fits in the catch-all category of ‘development’, and thereby steadily watering down what it can hope to achieve. Our expertise and capacity to implement an effective aid program has significantly weakened since DFAT absorbed AusAID in 2013. More elements of aid implementation are outsourced every day. Our bilateral aid is spread too thinly across too many partners. The list of challenges goes on. Below are some recommendations as to how we could improve the aid program to better serve the development goals that should be central to foreign policy in our region. First, the government should commit to increasing Australia’s foreign aid as a share of GNI from its current 0.22% to 0.35%, the peak reached in 2012-13 (with bipartisan support), by 2025. We are on the edge of (or within) a region of profound development need, yet we are heading toward the bottom third of OECD nations when it comes to the share of aid we give. There is an important global reputational hazard here – we cannot ‘punch above our weight’ in our foreign policy if our neighbours do not perceive us to be a good international citizen. Polling has consistently shown that foreign aid doesn’t move the needle for the Australian electorate, so we need our politicians acknowledge the critical role aid plays in our foreign policy and, ultimately, our national interest. I should also note that at 0.35% I am not advocating for the moon. This would be half the level (0.70%) that Australia committed to the United Nations when it signed up to the Millennium Development Goals in 2000. Second, the government should continue to scale down our bilateral activities. More than 40% of our aid is delivered through bilateral programs, and a further 15% is channelled through regional or cross-regional programs. We should continue to scale back our bilateral efforts to focus on our immediate region of the Pacific and Timor-Leste, and deliver more of our aid to broader Asia through regional and multilateral institutions. This would help focus our now depleted development expertise on a region where we should expect to, if managed correctly, be influential and able to affect positive change. At the same time, we could increase our standing and influence in regional institutions such as the ADB and AIIB where we should strive to be thought-leaders and policy-shapers, not just financial contributors. It would also free up more of our finite aid resources to focus on contributing to global public goods, humanitarian assistance, climate change and development oriented research. Third, the government should start thinking differently about the way in which we use our aid program in the Pacific. I will have more to say on this in a separate post but in brief, by acknowledging that foreign aid will remain a permanent element of our partnership with the Pacific, we can be more ambitious in the way in which we deliver our aid program and become a more reliable funding partner to the region. Fourth, the government should invest in a scoping study into the establishment of a development finance company for Asia and the Pacific. We spend a lot of time promoting two-way trade and investment and Australian investment in the region but, as our research on the Asian Development Bank has shown, Asia is at the start of a century of insatiable demand for capital. This is an idea that has been floated before by the likes of Bob McMullen and Jim Adams, and it warrants serious assessment. These recommendations will no doubt be added to the pile of hundreds of others from the international development community with regards to our aid program, all of which warrant consideration. But if there is one message that should resonate with the White Paper taskforce it is this: it’s time for development to come out of the cold and assume its rightful place as a central element in our foreign policy.